Expect Miracles Foundation’s young professional group (YPEM) gathered on Friday, March 3 at Public House. 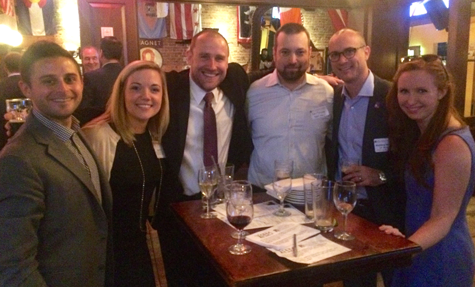 Attendees demonstrated their unwavering support for the mission of Expect Miracles Foundation as young professionals in the financial services industry once again joined together to network with their peers and support the fight against cancer. Attendees enjoyed an extended happy hour generously provided by Public House and a variety of delicious appetizers. As part of these young professional’s goals to network and fundraise even more in 2017, guests had the opportunity to learn more about the Inaugural Kan Jam tournament coming up on Friday, April 7. Over 30 guests even signed up for Kan Jam on the spot and were entered to win a mini kan jam set to practice their skills for the tournament. Congrats to Jim M. and Rob P. for winning the mini kan jam sets! We look forward to seeing all of you at the tournament on Friday, April 7, 2017! Please check out the event website to learn about forming a team, entering as a wildcard, volunteering or being a spectator. Contact Megan Melville at mmelville@expectmiraclesfoundation.org if you’re interested in learning more about the Inaugural Kan Jam Classic in New York!